The cool, moist conditions in the otherwise bleak Oranjemund, are ideal for vegetable production, as a local self-help groups has proven. Last week, the town’s main commercial force, Namdeb, donated a compost shredder to the vegetable project so that higher yields can be achieved. 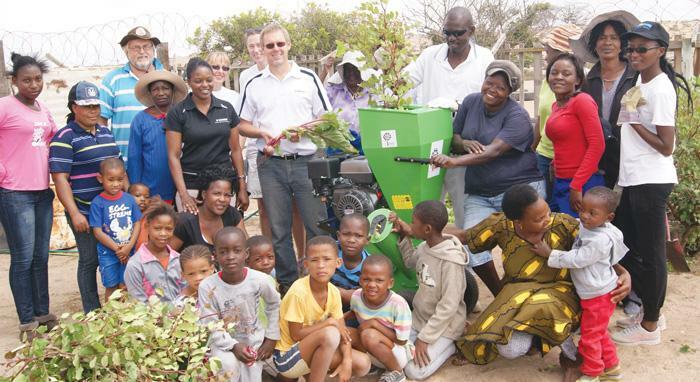 “In pursuit of supporting sustainable community projects and self-sufficiency, Namdeb recently donated a compost shredder to the Futree – Ngaye Onda Tameka Project at Oranjemund” the diamond miner said in a statement. The project is currently run by volunteers who provide gardening equipment and take care of maintaining the vegetable beds. The volunteers spend two to three hours every Saturday to tend the garden, or whenever they are available. Activities include weeding, pruning damaged leaves, watering by hand as well as checking and repairing the drip irrigation system when required. The volunteers have all demonstrated some skill in irrigation maintenance, general gardening and bee-keeping. So far, the gardening project has successfully grown butternut pumpkins, potatoes, carrots, tomatoes, spinach, kale, onions, beetroot and garlic on a small scale.